Northants have signed Surrey all-rounder Matthew Spriegel on a two-year contract. The 25-year-old, who has been involved with Surrey since childhood, made his first-class debut in 2007. Spriegel told BBC Sport: "I've been impressed with Northants' ambitions and where they want to go, and I'm happy that they see me as a big part of that. 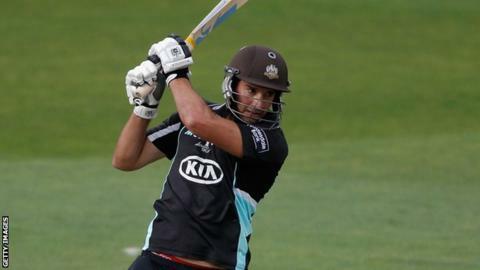 Spriegel has been a regular performer in 40-over and T20 cricket for Surrey. That's undoubtedly central to Northants' decision to sign him. He's also regarded as a "thinking" cricketer - possibly a future vice-captain. "But it is sad to be leaving Surrey. It's a big family here and I'm going to miss it." Northants chief executive David Smith added: "Our white-ball performances over the last 18 months have fallen below both the club and supporters' expectations. "I am sure Matthew will assist us in our efforts to re-establish a competitive [one-day] team." Spriegel has played only two first-class matches in the last two years, but has amassed 1,803 runs and taking 66 wickets in limited-overs cricket since making his Surrey debut in 2008. He also helped Surrey to beat Somerset in the 2011 CB40 final, taking 1-34 and hitting an unbeaten 24 to see them to a five-wicket win at Lord's. "I don't think anything will top that," said Spriegel. "To hit the winning runs is a feeling I'm trying to remember for as long as I can. But I need to be playing four-day cricket and that's something Northants have offered me." Northants head coach David Ripley said: "He is exactly the type of multi-dimensional cricketer we have been looking to attract to the club. "Matthew has shown a real hunger to improve himself in all formats and will give us some excellent options with both bat and ball in the short and longer form of the game." The club also state they are hopeful of adding at least one more player to the squad in the next few weeks. Meanwhile, Northants have released seam bowler Dave Burton, 27, who featured in eight games for the county during the 2012 season. Ripley added: "Dave worked very hard to earn his contract last year and provided good competition for the squad, but only managed to force his way into the first team for one first-class game."